Home » VectorVest » Reiterate buy Victoria (VCP) says VectorVest. The trend continues to be the investor’s friend. Reiterate buy Victoria (VCP) says VectorVest. The trend continues to be the investor’s friend. By Alan Green in VectorVest on 18th October 2017 . VectorVest first reported on the potential at VCP in Sept 2016, following which the stock continued to outperform, flagging up further opportunities in April and September 2017. 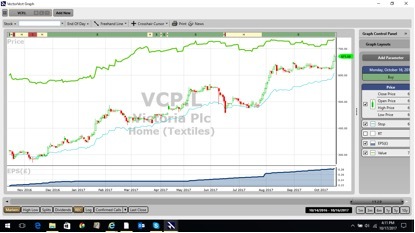 Once again today, the stock ticks all the boxes, demonstrating continued strong earnings growth; the GRT – Earnings Growth Rate, (reflecting one to three year forecasted earnings growth in percent per year) still records a rate of 26% for VCP, which VectorVest considers to be excellent. VCP also scores excellent ratings on RV (Relative Value) and RT (Relative Timing) metrics, and a ‘very good’ rating on RS (Relative Safety) metric, up from a ‘fair’ rating in April. Finally VCP’s valuation has again increased to 736p, and still offers investors some upside at the current 675p. The chart of VCP is shown above in my normal format. Earnings per share (EPS) is growing strongly. On cue the share has broken upwards on the 4th attempt and looks bound much higher over the next few weeks. Summary: This quality company clearly illustrates how the criteria identified by the VectorVest stock analysis and portfolio management system this time last year has materialised into a solid year of growth and stellar returns for shareholders. With VCP, the trend continues to be the investor’s friend, and VectorVest believes there is every reason to continue buying the shares in the run up to the November interims. Keep buying.